Even Mark McGwire knows he's a longshot for the Hall of Fame, despite his prodigious home run totals. A quarter of a century after the disgrace of Ben Johnson at the Seoul Olympics, more than a decade after the single season home run record was corrupted six times in four years (and not at all in 48 seasons before and since) and in the immediate wake of confirmation that Lance "Never Failed a Test" Armstrong -- surprise! -- masterminded a massive fraud, I still have to explain why I will not endorse any known steroid user for the Hall of Fame. Where are all the former players arguing for known steroid users to be in the Hall? Anybody? Listen to what Mark McGwire said in an interview after being hired as the Dodgers hitting coach after last season. McGwire is an admitted steroid user who retired before any testing took place. "It's a mistake that I have to live with for the rest of my life," he said. "I have to deal with never, ever getting into the Hall of Fame. I totally understand and totally respect their opinion and I will never, ever push it. That is the way it's going to be and I can live with that. "One of the hardest things I had to do this year was sit down with my 9- and 10-year-old boys and tell them what dad did. That was a really hard thing to do but I did it. They understood as much as a 9- or 10-year old could. It's just something, if any ball player ever came up to me, run away from it. It's not good. Run away from it." 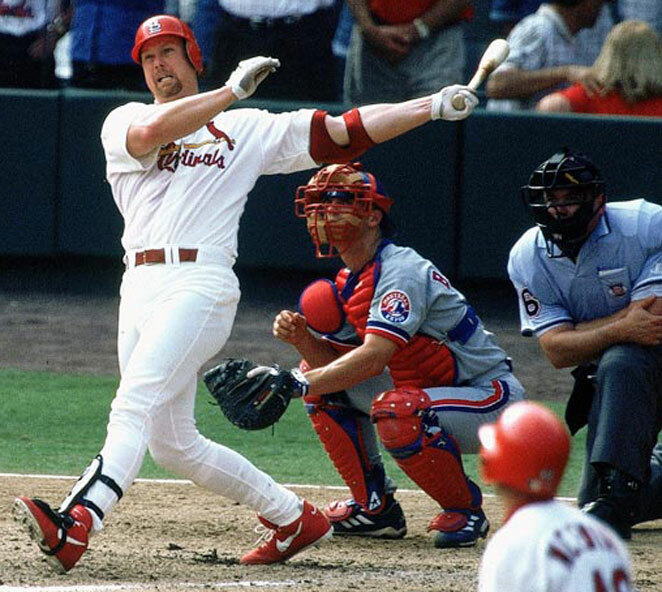 McGwire -- before or after admission -- never has received 25 percent of the BBWAA vote. The threshold for election is 75 percent. I respect the process. If Barry Bonds or Roger Clemens can clear the same bar 112 other electees have cleared since voting began in 1936, I respect that -- just as I would even if the consensus leaves nobody enshrined in results announced Wednesday. Consider this: this ballot is packed with eventual Hall of Famers no matter the Wednesday outcome. How do we know? In the 35 ballots from 1968, when current voting rules were put in place, through 2002, the average ballot included 10.2 eventual Hall of Famers -- though only an average of 1.6 per year reached the 75 percent threshold. Those 35 elections never had fewer than five Hall of Famers on the ballot (1995) and had as many as 16 (1969). (The writers have been fairly consistent in the flow of voting players in. Hall of Famers elected per year by decade since the '70s: 1.3, 1.9, 1.5, 1.7, 1.7). 1. "It wasn't against the rules." The conspiracy of silence to this day tells you all you need to know about the hollowness of such a claim. Again, we were a decade outside of the steroid bust of Ben Johnson. Steroids were a well-known taboo. Everyone knew, including those who took them, steroids were a conscious, elaborate, covert decision to go outside the boundaries of fair competition, not to enable performance but to enhance it beyond what was naturally possible. Pitcher Matt Herges, who said steroids made him "superhuman . . . an android, basically," once said, "We didn't have drug testing anyways. But it was still wrong." "I was a full blown cheater and I knew it," Naulty said. "You didn't need a written rule. I was violating clear principals that were laid down within the rules. Whether they were explicitly stated that I shouldn't use speed or testosterone didn't need to be stated. I understood I was violating mainly implicit principals. "I have no idea how many guys were using testosterone. But I would assume anybody that was had some sort of conviction that this was against the rules. Look, my fastball went from 87 to 96! There's got to be some sort of violation in that. It was not by natural cause. To say it wasn't cheating to me was . . . it's just a fallacy. There's just no way you could say that's not cheating. It was a total disadvantage to play clean." 2. "Everybody was doing it." This canard infuriates me the most. When I wrote the 2002 SI investigation on steroids in baseball in which Ken Caminiti said about half the players in the game were juicing, people criticized him for exaggerating the problem. Many of those same people now are using the "everybody was doing it" excuse. It's a lazy, terrible insult to everybody who played the game clean. The genesis of that article was that during the 2001 season many clean players were complaining to me that steroids had become so prevalent in the game that they felt clearly disadvantaged. That's when I knew the game reached a tipping point: when a few rogue early adopters had grown into hundreds of cheaters. The hundreds who played the game clean were harmed. Many lost jobs, money and opportunity by choosing to play the game clean. I think of them every time I get a Hall of Fame ballot. As so many writers go to bat for steroid users, the clean players are dismissed as "everybody was doing it" or, "pitchers were doing it, too, so it was an even playing field." Go back and read the story of Naulty and the four Miracles of Fort Myers -- three pitchers who played clean were left behind in the minors as Naulty juiced his way to the majors -- and tell me about even playing fields. Never has there been a more uneven playing field since the game was integrated than the one during the Steroid Era. You have to understand how much steroids changed the game. In the rush to dismiss them, people have thrown out awkward analogies about petroleum jelly, sandpaper, cork, tacks, diet pills from the '70s, etc. under the catchall category of "cheating." Stop it. You know what steroids are like? Steroids. Nothing else rises to the level of steroids when it comes to anabolically changing the body so that it can do far more than it ever could do without them. Steroids took hold because they take a player well beyond his natural ability. Caminiti said he felt like "Superman" with steroids; they even improved his speed. Beware the player who uses the Mr. Olympia analogy: you know, "if steroids helped baseball players the game would be populated with bodybuilders." It's an awkward cover. The edge players gained was enormous, such as Naulty gaining 68 pounds and 10 miles an hour on his fastball -- using steroids only in the offseason, by the way! - or a minor league teammate, Jeff Horn, who said, "A good fastball could get in on me and tie me up. When I had the stuff in me I could get to those pitches easier. With steroids you could do those things you otherwise couldn't do. The things that kept you in the minor leagues all of a sudden didn't hold you back any more." Horn bought his steroids off the internet. There are all kinds of steroids with all kinds of purposes that can be combined with all kinds of other drugs. People talk about steroids as if it's one magic pill with the same effect for everyone. The truth is even within the world of steroid cheats there are many levels of unfairness. Take Bonds, for instance, a major league player with world class ability already who, thanks to Game of Shadows, we know engaged in the most sophisticated, state-of-the-art doping regimen ever documented in baseball. Caminiti, on the other hand, bought testosterone in Mexico and, with disastrous effects to his body, self-medicated. The extrapolation of baseball before Caminiti spoke up was this: the trust in a fair game was being depleted as jobs and games were being decided by who had the best chemist. A parade of players pushed baseball in that direction, and many of the names on this Hall of Fame ballot were not just in the parade but, because of their success, the drum majors leading it. I do believe players from this era begin with an assumption of innocence. I believe Fred McGriff, for instance, is vastly undersupported in Hall of Fame voting. He retired as only the 10th player with an OPS of .886 or better with more than 10,000 plate appearances. The other nine are a who's who of inner-circle Hall of Famers: Mike Schmidt, Hank Aaron, Frank Robinson, Willie Mays, Stan Musial, Mel Ott, Babe Ruth, Ty Cobb and Tris Speaker. You may ask, "But how do you know he's clean?" I start with a presumption of innocence and then consider any information about connections to steroids. With McGriff, I have come into no such information to move off the presumption. I try to be fair. Speculation alone is dangerous. I'll use Jeff Bagwell as an example. He's a guy I voted for again. But here are some facts about Bagwell: he hired a bodybuilder (later hired by Luis Gonzalez) in 1995 to make him "as big as I can," flexibility be damned; took the steroid precursor andro (as well as supplements such as creatine, HMB, zinc, etc. ), underwent a massive body change; maintained a bodybuilder weightlifting regimen; called the whistle-blowing in 2002 by Caminiti "a shame" and the one in 2005 by Jose Canseco "very disappointing . . . whether it's true or not;" promulgated the red herring that drugs don't help baseball players ("Hand-eye coordination is something you can't get from a bottle," he said of his andro use); and as recently as 2010 in an ESPN interview openly endorsed steroid use by anyone from a fringe player ("I have no problem with that") to superstars such as Bonds and McGwire ("I know you took it but it doesn't matter") as well as the HGH use by an injured Andy Pettitte ("That's not a performance enhancer"). I disrespect his position on steroids and wonder why someone of a bodybuilder mindset who endorses steroid use would walk right up to the steroid line himself without crossing it. His comments, right before his first year on the ballot, bothered me so much that I didn't vote for him that year -- I needed more time to process his candidacy, a kind of deferral that is not uncommon. Without subsequent information, I have voted for him since. No, voting isn't easy. This is the kind of toxicity the players left behind from The Steroid Era. Now use Armstrong as an example when it comes to PED evidence. His defense, even when blasted with 1,000 pages of evidence of PED use by USADA, has remained the same for years and sounds familiar to anybody who has followed the lying steroid users in baseball. His lawyer responded by noting that Armstrong has passed "500-600 tests" and that USADA was on a (here it comes, everybody) "witch hunt" to go after a "retired cyclist." Cue the violins. Now think about how Armstrong was busted: with no admission, no positive test, no court ruling. (In fact, the US Attorney in Los Angeles only months earlier dropped an investigation into Armstrong's drug use.) Put him on a Hall of Fame ballot and half the writers would vote for him under the "there's no evidence" umbrella. How was Armstrong, long associated with PED rumors, finally exposed? Teammates. Eleven former teammates finally said the emperor had no clothes. They, too, were dirty. Armstrong didn't just use PEDs, he also instilled and maintained an entire system of corrupt competition, all of it based on a culture of silence and deceit. Sound familiar? The same lesson applies to baseball. The Steroid Era, too, is an ongoing archeology: buried secrets known to many -- teammates, trainers, suppliers, coaches, etc. -- that sometimes get revealed with a little brushing away of the topsoil, not always as public as the work of Canseco or Mitchell. Finally, why should we care at all? Good question. You, in fact, may not care. But this one of 570 or so is my ballot. I do care. One reason is the "character clause" in the voting instructions, something that many writers and observers have mangled out of shape in Cirque du Soleil acrobatics to excuse steroid users. The label "character clause" has become a pejorative. No such title exists. The instructions say only, "Voting shall be based upon the player's record, playing ability, integrity, sportsmanship, character, and contributions to the team(s) on which the player played." People have twisted this to mean "morals," or, that since "racists" are in the Hall, you must allow steroid users. Such assumptions have led people to promote the idea of removing the "character clause." Do these people know the origin of the clause? The clause comes from the man who came up with the very idea of the Hall of Fame itself: Alexander Cleland, an immigrant from Scotland who worked for Stephen Clark, a wealthy lawyer who grew up in Cooperstown. After a meeting with Clark in Cooperstown in 1934, Cleland saw laborers working on Doubleday Field and learned from them about plans there five years hence to celebrate the 100th anniversary of the game's mythical beginning. On the train to New York, an inspired Cleland composed a memo to Clark about the idea of a baseball museum in Cooperstown. Later, with the backing of NL president Ford Frick, Cleland and Clark included the idea of enshrining the best players as part of the museum. They decided to enlist the Baseball Writers Association of America to hold an election in 1936 to decide which players would be so honored. According to an August 1944 memo by Hall of Fame treasurer Paul Kerr, it was Cleland who listed general rules for voters, including the 75 percent threshold and also deciding that "those worthy of Hall of Fame election should be selected from the ranks for ability, character, and their general contribution to base ball in all respects." Now you know that one of the founding fathers instructed "character" to be considered from the birth of the Hall itself. It's a central, original principle of the voting process. You don't just dismiss the Thomas Jefferson of the Hall of Fame and 77 years of history to accommodate steroid users. (Here's an example of why "character" has mattered from the very beginning of Hall elections. In that inaugural 1936 election, 226 baseball writers cast ballots. They could vote for up to 10 candidates, and mostly all did. A total of 2,231 votes were cast, or an average of 9.87 names per ballot. Joe Jackson, a career .356 hitter, received only two of the 2,231 votes. Jackson was fully eligible for Hall of Fame election, though commissioner Kenesaw Mountain Landis had banned him from baseball because of his involvement in the 1919 Black Sox scandal. The writers overwhelming decided he was not a Hall of Famer. Forget the racists and scoundrels comparison. Here's my issue with steroid users as it relates to the "character clause:" it's about how they played the game between the lines, not how they conducted themselves outside of it. It's an issue of competitive integrity, not personal integrity. They bastardized baseball, eroded the implicit fairness of it and disadvantaged those who chose to play fairly to extents never seen before. McGwire understands he is not getting into the Hall of Fame. Neither are Rafael Palmeiro or Sammy Sosa. Clemens and Bonds are not getting in this year or probably the next few years, though they may gain support as some writers drop their "first ballot" protest non-votes or more come around to think that "they were Hall of Famers before they started juicing," a rationalization I reject. The notion that steroid use is acceptable based on some sliding scale of accomplishment or talent is strange but entirely 21st century American. Howard Gardner, a professor at the Harvard Graduate School of Education, said that over the 20 years he has studied professional and academic integrity, "the ethical muscles have atrophied," in part because of a culture that exalts success, however it is attained. He said the attitude he has found among students at elite colleges is: "We want to be famous and successful, we think our colleagues are cutting corners, we'll be damned if we'll lose out to them, and some day, when we've made it, we'll be role models. But until then, give us a pass." Steroid users want the pass, though they remain too shamefully silent to ask for it. I tend to be slightly tougher than average on the Hall of Fame voting scale, but this year voted for six (right around the recent average of the electorate) of the 36 names on the ballot: Bagwell, Craig Biggio, McGriff, Jack Morris, Tim Raines and Curt Schilling. Next year could present an even harder challenge. With six on my ballot this year, and the possibility of a shutout looming, and Greg Maddux, Tom Glavine, Frank Thomas, Mike Mussina and Jeff Kent all viable first-time 2014 choices, I could have more good choices than available spots. Should the Hall change the rules to allow for more than 10 votes per ballot? It's a legitimate question as the voting has begun to reflect the messiness and complications of the Steroid Era.